For Moldova it’s this will be the 7th entry in the Eurovision Song Contest. The impressing debut entry has been “Boonika bate toba” by Zdob si Zdub (#6) in 2005 in Kiev, which made a very good 6th rank. This was a Russian-Folk-Rock number with a grandma with the big drum. Due to the unusual performance and the fresh music Moldova qualified for the final and had a huge gig in front of a 120 million audience. What a coincidence that the group Zdob si Zdub are also going to be the representatives this year in Düsseldorf! The song “So lucky” is even more up-tempo and melodic as the entry from 2005, it’s a cool summer song with an interesting interlude. 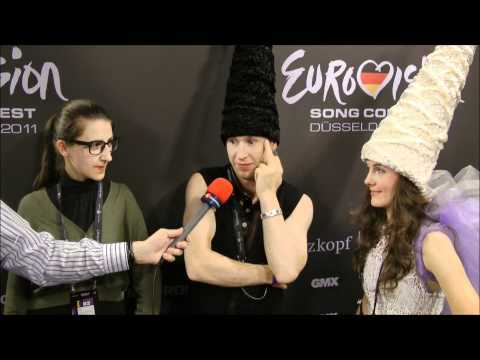 In the national final the group has been wearing funny high hats, if those will also be worn at ESC is still unclear, but this will definitely be a detail, which will be remembered well. The group is very well known in Eastern Europe, so there will be many votes coming from the ex-Soviet Union countries. Former Moldovan entries which are worth to mention were: “Fight” by Natalia Barbu (#10) in 2007, “Hora din Moldova” by Nelly Ciobanu (#14) in 2009 and “Run away” by Sun Stroke project (#22). Moldova is lying between Romania and the Ukraine and so it’s no wonder that the music taste is quite similar, no wonder that this also effect the voting. Moldavians and Romanians do understand the others language, but this is redundant due the fact that both countries will have songs in English.